Carol Pecos was born into Jemez Pueblo in 1934. 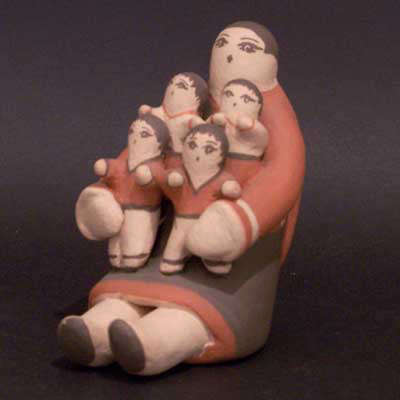 She learned the traditional art of pottery making from her mother, Louisa F. Toledo and passed her knowledge on to her daughter, Rose Pecos SunRhodes. Carol's grandmother, Lupe Madalena Loretto, made clay figures in the 1920's and the family tradition has been passed down daughter to daughter since. Carol made her first storyteller around 1974 and discovered just how much fun they were for her. In the 1980's she started making storytellers with larger and larger numbers of children on them. In her words: "I am expressing myself as a woman and create what I know about. My mother was a potter. I learned at age 8 by watching her and grew up loving to work with clay. I feel good and energized by what I do. When I go into the clay world I just let go."